Reports of spider bites seem to be on the increase - hardly surprising with present media attention coupled with the spread of Steatoda nobilis (Thorell, 1875) and S. grossa (C. L. Koch) across the South of England. In Newsletter 76 (1996) John Parker wrote a short article about British spider bites in which he mentioned Steatoda. Here are some more accounts of close encounters with members of this fascinating theridiid genus. 'The bite I received on 22nd December, 2002. I was in my car when I felt a slight burning sensation on the right hand side of my ribcage. This increased in intensity, like being scalded, spreading first to my right armpit then down into my right arm. Simultaneously, I felt stabbing pains, firstly in my ribs then spreading as described above. I also began to feel generally unwell, 'flu-like symptomsâ€”aches, sweats, fatigue. I was perspiring, particularly at the site of the bite. However I felt cold and shaky. I then felt sick and giddy and slightly disorientated. This all occurred in little more than 10 minutes by which time (fortunately for me) I was driving by Bournemouth Hospital, so I turned straight into Accident & Emergency. I had a 30-minute wait to see the Triage nurse, during which time the above symptoms persisted, making me feel incredibly unwell and obviously anxious. My right arm felt cold, heavy and numb, it went quite purplish in colour and ached, it looked slightly puffy to me. The nurses noted that I was flushed, my face was a little puffy and I had a raised red area 5-6 cm in diameter with a visible bite mark. I was given piriton at that point and an hour or so later, when I saw the doctor, the red area was reduced and I was starting to feel better. My arm looked and certainly felt more normal. I was prescribed a course of piriton, penicillin and steroids (prednisolone), I believe to cover all angles as, at that stage, I had no idea what could have bitten me. I continued to feel unwell that day and it wasn't until Christmas Day that I actually felt more like my normal self. My car remained untouched between the 22nd and 25th and I discovered the squshed spider on my car seat on Christmas Day. Finally, 19 days later, I'm left with a tiny red raised mark which continues to itch and burn slightly'. Added by John Partridge at 22:20 on Mon 13th Feb 2012. On the 6th. 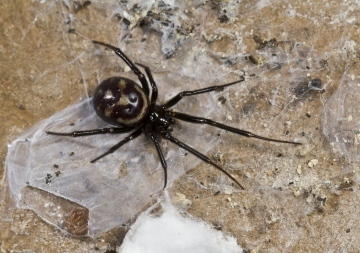 April 1997, while looking for cave spiders in the sewer system of a small housing estate in East Leicester, two sub-adult and an adult female Steatoda grossa were found hanging beneath the undersides of man-hole covers. The specimens were found singly with two of the specimens being about 200 metres apart. The sub-adult specimens were the first to be found and, at first, I thought they were large specimens of Steatoda bipunctata. but on finding the female it became clear that they were something new. The sewer system also contained hundreds of Nesticus cellulanus. just the odd specimen of the locally rare Lessertia dentichelis. and both Tegenaria domestica and T. gigantea. Added by John Partridge at 11:05 on Tue 3rd Jan 2012. Between 19th April and 12th October 1996, I kept notes on the behaviour of three adult female Steatoda grossa (C. L. Koch, 1838) which had taken up residence in my 'private S.S.S.I. ': the 'loo'. Their retreats were arranged one above the other in an angle of the room: one (Sgl) just below the ceiling, the second (Sg2) under the cistern, and the third (Sg3) lower downâ€”between the downpipe and the wall. I had been watching them for quite some time before realising that observations without records are virtually useless: something that a biology student would learn on day one, I suppose. My attention had been captured by the suspicion that the Steatoda were feeding exclusively on woodlice. Using Woodlice by Oliver & Meechan (1993), I identified prey items that had been dumped from the webs: all were Armadillidium depressum Brandt, 1833. Furthermore, examination of the relevant literature revealed a degree of coincidence in the ranges of S. grossa and this particular species of woodlouse. Newly captured prey items would often be left near the periphery of the web, defensively rolled up but securely wrapped in silk. They might then be moved in stages to a position closer to the retreat. Length of time between capture and disposal varied considerably: between two and six days. On many occasions, I observed the spiders cutting away the silk, unrolling the woodlouse and apparently exploring insideâ€”to feed more efficiently, I assumed. However, on one occasion, I saw Sg2 move from below her unrolled prey to a position above it. She then proceeded to twist the woodlouse round and round in the horizontal plane and, finally, with a massive push from the forelegs, expelled it from the web to hit the floor with a thud. I suspect that Sgl and Sg3 both fell victim to a Pholcus phalangioides whose presence had not been spotted until it was too late. I cannot be certain about this, as I only found their remains. Sg2, who had a very secure retreat under the cistern, was found dead in her web one late October morningâ€”old age? Unfortunately, none of the three had issue. Throughout this time, I had never witnessed actual capture of prey which always seemed to take place at night. But life is full of mixed blessings: the oppressively hot and humid weather of August proved too much for my refrigerator, but when I dragged it out, I was pleased to find a female S. grossa underneath. I made a cage from a clear plastic container and some cardboard and a retreat from rolled-up card. She quickly settled in, making a typical theridiid web and hiding in the retreat. I introduced a woodlouse which, in due course, unrolled itself and began to wander around the sides of the cage. When the spider had located the woodlouse, she began looping silk wherever possible. Where looping was out of the question, she dabbed on silk as if attaching a drag line and lines of silk were taken back to spots near to the centre of the web. She continued this process for about ten minutes, until the tension from the stretched silk overcame the holding power of the woodlouse and it was suddenly sprung away from the wall and left dangling in the centre of the web. The woodlouse only seemed to react when snatched from the wall; it then rolled up. Sg' then set about wrapping her meal up very elaborately before returning to her retreat. Later she was observed moving the prey within the web by stretching new lines on one side and severing them on the other. The woodlouse was introduced at noon on 16th August 1997 and, having been fed on spasmodically, was found discarded on the cage floor on the morning of the 20th. The prey's legs were still moving late on 18th, so it seems that Sg' likes to keep her food fresh. Incidentally, anyone living within the range of S. grossa and who wishes to find one should investigate an outside stopcock. Having to turn my water off recently, I was delighted to find my favourite spider in there, 'leading the life of Riley', surrounded by woodlice. I could not bring myself to spoil her lifestyle, but must remember to look to see her young before they disperse, if the egg sac she is guarding proves viable. Added by John Partridge at 10:59 on Tue 3rd Jan 2012. To the east of West Bay in Dorset the sea shore is bounded by sandstone cliffs rising to 60 to 80 feet. Weathering and stone fall has eroded the cliff face providing deep clefts which can be from 3 to 24 inches wide extending from 6 to 18 feet deep into the face of the cliffs. The height of the clefts varies from 3 to 7 feet and in the upper parts of these in their narrowest parts a tangled mass of spider webs was observed but no spiders were seen during the day time. A further search at night with the aid of a torch revealed the webs to be occupied by the large Theridion spider Teutana grossa. This is the largest Theridion species occuring in Britain and is conspicuous by the purplish violet colour of the abdomen. A mature male and female were collected on the 1st September 1972. Several other females were seen in similar habitats and there was colonisation of this species for approximately 600 feet in the cliff face along the line of the shore. The high water mark was about 75 to 100 feet from the southward face of the cliffs with a steep shingle beach. T. grossa is usually found in outhouses and buildings associated with man in Britain although Mr. Vernon Wheatley has also observed the species living out of doors in Cornwall.